Sunday - Jesus Rises as Firstborn from the Dead! 1 Corinthians 15v1-8: Now I declare to you, brothers, the Good News which I preached to you, which also you received, in which you also stand, by which also you are saved, if you hold firmly the word which I preached to you-unless you believed in vain. For I delivered to you first of all that which I also received: that Christ died for our sins according to the Scriptures, that he was buried, that he was raised on the third day according to the Scriptures, and that he appeared to Peter, then to the twelve. Then he appeared to over five hundred brothers at once, most of whom remain until now, but some have also fallen asleep. Then he appeared to James, then to all the apostles, and last of all, as to the child born at the wrong time, he appeared to me also. That was the Apostle Paul, writing to the Corinthian church about the Jesus having been raised from the dead - physically! All four Gospels, Matthew, Mark Luke and John, tell us that Jesus was crucified, died and was buried in a tomb. What do these four Gospels say about the Jesus' resurrection or rising from the dead? Notice the changed attitude of the disciples after seeing the risen Jesus. They changed from defeated, cowardly people to victorious, brave people. Nobody who could have produced the dead body of Jesus, did so. Their silence is as significant as the preaching of the Apostles. Or take the multiple appearances of Jesus to various numbers of individuals and groups of people at, various times of the day and in differing circumstances. This shows that Jesus' resurrection was physical in nature! Some people say Jesus' resurrection was spiritual in nature but not physical. But the amount of people that saw Him physically afterwards dispels that particular myth. What about the current tangible evidence - the survival and inordinate growth and impact of the early church and that the church is still growing 2000 years later. If there was no bodily resurrection of Jesus' would people really have risked persecution and death for knowing a lie? One or two people maybe, but not hundreds and thousands! Lastly, Jesus didn't die on the cross but somebody was substituted for him. This is certainly untenable, given the rigidity and strict record keeping of Roman rule and with the eyes of the Jewish hierarchy watching. This conjecture is a lie of satan, because he knows the significance of Jesus having risen physically from the dead. The resurrection proved and vindicated all Jesus' teaching and claims as the suffering Servant and attested to His being fully God and the last Judge of all mankind (Isaiah 53v10-12; Acts 2v36; Acts 3v13-15; Romans 1v4). The resurrection, declared God's approval of Jesus obedient service and the fulfilment of all the Old Testament promises, resulting in forgiveness of sins and salvation being only found in and through Jesus Christ, which was the prime motive for evangelism in the early church (Acts 2v32, Romans 4v24-25). Jesus' resurrection is a sign of the bodily resurrection for all believers in Him, giving a new attitude to death and transforming hopes (1 Corinthians 15v12-58, Romans 8v10, 2 Corinthians 4v14; 1 Peter 1v3 & 21). As the resurrected King, Jesus now intercedes for us and has perfected the redemption of all those who choose to follow Him (Romans 5v10; Hebrews 6v20, 1 Peter 1v21). Finally the resurrection of Jesus' physical body is a sure victory over satan, sin and death. All three are conquered and squashed. Satan is a defeated creature and will do anything to drag people into defeat with him. The power of sin is conquered, and sin's grip is overcome if you are a believer in Jesus Christ. Finally, as I said earlier, death has been beaten, because those who believe and trust in Jesus Christ will live forever with him - death is not the end but a beginning. If Jesus Christ did not physically rise from the dead then as Paul states in 1 Corinthians 15v12-19 "Now if Christ is preached, that he has been raised from the dead, how do some among you say that there is no resurrection of the dead? But if there is no resurrection of the dead, neither has Christ been raised. If Christ has not been raised, then our preaching is in vain, and your faith also is in vain. Yes, we are found false witnesses of God, because we testified about God that he raised up Christ, whom he didn't raise up, if it is so that the dead are not raised. For if the dead aren't raised, neither has Christ been raised. If Christ has not been raised, your faith is vain; you are still in your sins. Then they also who are fallen asleep in Christ have perished. If we have only hoped in Christ in this life, we are of all people most pitiable." Or let me put it in my own words - if Jesus Christ did not physically rise from the dead, we as Christians are the product of the greatest delusional lie and are the most foolish of all people. Jesus walks with us, whereever we go and in particular in the darkest periods of our life. Just as he did with the two people on the road to Emmaus, he walks with those who proclaim to follow Him (Mark 16v12-13, Luke 24v13-32). Jesus speaks whenever the Bible is faithfully preached and read from, just as He opened the eyes of those on the Emmaus road when He explained the Scriptures (Luke 24v27). Jesus meets us in the Communion or Lord's Supper, with the bread and wine, which symbolise His flesh and blood as an act of remembrance of what He did for humanity. But that is not the end, because Jesus has promised that He is coming again. Not as a baby next time, but as an all conquering Son of God in judgment to gather those who follow Him. Are you ready? Isaiah 53v10-11: Yet it was the LORD's will to crush him and cause him to suffer, and though the LORD makes his life a guilt offering, he will see his offspring and prolong his days, and the will of the LORD will prosper in his hand. After the suffering of his soul, he will see the light of life and be satisfied by his knowledge my righteous servant will justify many, and he will bear their iniquities. Those words were spoken of the coming Messiah, by the prophet Isaiah centuries before Jesus Christ. Together we have looked at during this Easter series, Jesus' mission and identity and have placed Him as the Messiah spoken about throughout the Old Testament, including Isaiah. We have looked at Jesus' last teaching, last prayers and the events of his last night. Following his betrayal he is now facing trial in a Roman court, being interrogated by Pontius Pilate. Now, as we look together briefly at John 19, let us see what happened to Jesus Christ - His condemnation, crucifixion, death and burial. Pilate gave in and permitted the flogging and mockery in the hope of shaming Jesus' accusers (John 19vs. 1-3). Pilate affirmed Jesus' innocence after the scourging (John 19v4). Jesus' refusal to answer stung Pilate into reminding Jesus of his Roman authority (John 19v10). Jesus, however, corrected Pilate's idea of authority and told him that although Pilate may have power on earth, his power did reach beyond earth (John 19v11). Jesus knew that his work of bring people back to God in a loving relationship did not rest on the actions of a mere Roman governor. Pilate was more concerned with his own position than he was for justice. In all this, we see Jesus as the true Passover lamb. Jesus bearing his own cross, was killed as a common criminal (John 19v17). We read, that Pilate was responsible for fixing the sign "The King of the Jews" (John 19v21-22). The clothes of condemned prisoners were given to soldiers on duty (John 19v23). Even when he himself was in agony, Jesus showed concern for his mother, committing her to the Apostle John (John 19vs.26-27). In Jesus' final moments he uttered "I am thirsty." (John 19v28) and "It is finished." (John 19v30). The desire of the Jews (John 19v32) to fulfil their rituals was important because the Sabbath fell within the Passover festival. The breaking of legs (John 19vs.32-33) sped up the process of death. The piercing of Jesus' side, and the flow of blood and water proved Jesus was really dead (John 19v34). Joseph of Arimithea and Nicodemus buried Jesus. The significance of "in which no-one had ever been laid" (John 19v41) is to demonstrate that the body of Jesus at no point came into contact with the decay of a dead body. But his burial is not the end of the story. Tomorrow we will look at some of the other character & events that happened around the cross, and then on Sunday we will look at the end of the story. But before we leave today, lets investigate what Jesus' death on a Roman cross two thousand years ago means for humanity today and why He had to die on a cross in the first place. 2. What Has Jesus' Death Done For All Mankind? All human beings, in their natural state, are born sinners and have rebelled against God (Romans 3v23). However, because of Jesus' death on the cross God offers forgiveness (Ephesians 1v7), Peace (Romans 5v1) and reconciliation with God, so that we are no longer His enemies (2 Corinthians 5v19). Through the cross, and only through the cross, we are made just before God (Romans 3v24-26), it cleanses us from sin (1 John 1v7) and makes us right before Almighty God (2 Corinthians 5v21). Because of the Cross, we have direct access to God (Ephesians 2v18) and Jesus Christ intercedes for us (Hebrews 2v17-18). Because of Jesus Christ's death on a Roman cross, all those who follow Him have freedom from the power of slavery to sin (Galatians 5v1) and freedom from the power of the devil (Hebrews 2v 14). None of the above things are true if we do not follow Jesus. 3. Why did Jesus go to the cross? It provided a covering for sin. It showed the great cost of sin. It was an exchange or substitution. The solution lies not in continual animal sacrifice of the Old Testament because Hebrews 10v4 reminds us that the blood of animals cannot take away sin but was only a veneer or covering. That was why it was necessary to repeat time and time again! It is only through the death of Jesus, that sin is taken away (Hebrews 9:v11-15, 26-28), because Jesus is our permanent sacrificial substitute! Jesus died for our sin, the just for the unjust (1 Peter 3v18). That is how God is both just and the Justifier of sinners. That is why Jesus needed to be both fully God and fully human! If he lacked either, it would not be the full substitutionary sacrifice that was necessary to bear the permanent consequences of sin! When Jesus died on the cross, in our place, he bore the consequences of all sin - past, present and future. He therefore became sin for us (2 Corinthians 5v21) and it was His precious blood as a lamb without spot or blemish (1Peter 1:18-19) that fulfils God's requirements permanently. Towards sin and sinful behaviour, God has great fury, anger and wrath (Jeremiah 21v5). Yet as Micah 7v18 "He is slow to anger and quick to forgive". Propitiation basically means the turning aside of God's anger by the offering of the sacrifice of Christ. God's anger and judgment of sin falls on Christ, instead of us. We need to approach God to appease His anger, in order to accept it (Romans 3:25; Isaiah 53:5; John 2:2, 5:6). Not only was it propitiation, but also an act of redemption! In the time of the New Testament, this word was used to refer to the buying back of a slave - the price paid to buy the slave's freedom. God paid redemption so that humans can be freed from the slavery to sin (John 8:35 Romans 7:14). The price was paid (1 Peter 1:18-19) and so we are redeemed with the precious blood of Christ (1 Corinthians 6:19-20). But it is our responsibility to choose that way! God does not coerce forcefully - He leaves it as a choice for humans to make as individuals. We must follow Him obediently, wherever He leads. 4. Victory over Satan, death and sin. As we look back through the Gospel accounts, we see Jesus being tempted and taunted by satan. We see the temptations in the wilderness, satan using the Apostle Peter to try and deflect Jesus away from the cross and satan using Judas to betray him. If Jesus had ever succumbed to temptation, and sinned in thought, word, action or inaction, then He Himself would have needed a Saviour. That is why Jesus is the perfect sacrifice - because he never sinned and always did what He saw God the Father wanting Him to do. Jesus' death on the cross is the centrepiece of all human history and the focal point of eternity. At the cross, Jesus' mission is accomplished. At the cross, this God-man, Jesus Christ paid the penalty for all sin of all time, so that people can have the opportunity to be restored into relationship with God. Some people say that Jesus didn't die on the cross, but rather somebody was made to be His substitute. But this is a lie of the devil. Nobody could have been a substitute or the Jewish leaders would have said so when the rumours of Jesus resurrection began to circulate. The Romans kept strict discipline and regimen and nobody would have been able to get in amongst the Roman soldiers and somehow substitute themselves for Jesus. Yes, somebody else carried the cross for Him, but nobody but Jesus was nailed to that cross. Jesus died on that cross and not some substitute. The cross is not a symbol to be merely placed around the neck as an item of jewellery or fashion. The cross is not meant to portray Jesus as some form of sadomasochistic tragi-hero as some people would make it out to be. The cross is God's solution to the problem of sin, suffering and pain. The cross is a choice. You can choose to deny the cross and say it doesn't matter, that it is an irrelevance, and that is your right. God will not force people to love him. If He did, He would have created Adam so that Adam would automatically love him and not given him free will to rebel. That way the cross would not have been needed. But such is the enormity of the love of God, that each person has a choice to make - follow Jesus and take up your own cross and be an overcomer for Him. Or a person can deny the cross and its meaning and when Jesus Christ comes again in judgment, they will find that He denies them entrance into His glorious kingdom. How a person thinks of the cross, ultimately has relevance to them and affects their reality. The cross, epitomises God's glory, and if there was any other way that He could restore people into relationship with Himself, surely He would have done it that way. But there was no other way - Jesus Christ, simultaneously fully God and fully man, died on a Roman cross. He took on the sins of the world, paying the greatest price, so that people can be restored into relationship with God the Father. That includes you and me. From that time till his last night, during His 3 years of ministry, Jesus has preached the good news of God's salvation to reconcile people back into relationship with Almighty God. Through the cross, His mission will be fulfilled. Passover, Pentecost and Feast of Tabernacles were the three most important feasts on the Jewish calendar (Leviticus 21). All Jewish men were expected to visit Jerusalem (Deuteronomy 16v16). The Passover Feast was to commemorate the deliverance of Israel from Egypt, and it was a time for remembering and rejoicing (Exodus 11-12). Of all the events that took place that night, we have only time to look at three of them - Jesus plans, Jesus prepares and Jesus serves. Now the Feast of Unleavened Bread, called the Passover, was approaching, and the chief priests and the teachers of the law were looking for some way to get rid of Jesus, for they were afraid of the people. Then Satan entered Judas, called Iscariot, one of the Twelve. and Judas went to the chief priests and the officers of the temple guard and discussed with them how he might betray Jesus. They were delighted and agreed to give him money. 6He consented, and watched for an opportunity to hand Jesus over to them when no crowd was present. First cup of wine and a dish of herbs and sauce. Story of the Passover recited. Psalm 114 to 118 were then sung. Depending on your church, it can be called amongst other things, the Eucharist or The Lord's Supper. Christian Disciples are commanded to participate, as Jesus said: "Do this in remembrance of me" (Luke 22v19). Some churches do it every service and others do it monthly. Whenever we participate in it, we do it regularly as a remembrance of Jesus until He comes again (1 Corinthians 11v26). The bread symbolizes His body broken on the cross and the wine symbolizes His blood which was shed on the cross. Therefore before we partake of the bread and wine, we are to examine ourselves and confess any unforgiven sin (1 Corinthians 11v28-29). This is done because it would be hypocritical to eat it while harbouring known sin in our hearts and having fellowship with Jesus and others in the church! All these symbolize the New Covenant made between God and Jesus' Disciples - a Covenant guaranteeing salvation! The new covenant is a new meal, in order to remind his followers in every age about the work of Jesus Christ on the Cross. The new covenant (Luke 22v20), Jesus claims that His death, was spoken about by the prophets Jeremiah (Jeremiah 31v33-34) and Ezekiel. It was a new covenant in which God's people will be able to know Him intimately for their sins will be forgiven. Whenever a covenant was made between God and man in the Old Testament, blood was always shed. Jesus' blood will be the seal on this New Covenant, which is why we remember it. Two other main views insist that it is more than just symbolic! Firstly, there is transubstantiation, which believes that the bread and wine actually become the blood and body of Jesus Christ. Secondly there is, consubstantiation, which believes that the body and blood of Christ are present in the Communion meal. However both of these views would indicate that Jesus Christ is being re-sacrificed and Hebrews 7 refutes these views, in particular Hebrews 7v27 which talks about Jesus' death on the cross "For he did this once for all, when he offered up himself.". The bread we eat and wine we drink at Holy Communion are only symbolic of his sacrifice and can never be a re-enactment. Jesus washes the disciples' feet. As part of the custom of the day, a servant or slave usually undertook foot washing of guests. Since none of the disciples had done this, Jesus Himself undertakes the task (John 13v4-5). Peter is recalcitrant and resistant as always, objects (John 13v6, . Peter learns that only those cleansed by Jesus and trusting in Him fully, can be a part of the kingdom (John 13v7, 9). As we look back at this episode, knowing what we do now of the Cross, we learn how this simple act of washing feet is symbolic of Jesus' sacrificial death on the Cross. All the elements in the plot conspiring against Jesus had been allowed for. The death of Jesus was no accident (1 Peter 1v18-21) "For you know that it was not with perishable things such as silver or gold that you were redeemed from the empty way of life handed down to you from your forefathers, but with the precious blood of Christ, a lamb without blemish or defect. He was chosen before the creation of the world, but was revealed in these last times for your sake. Through him you believe in God, who raised him from the dead and glorified him, and so your faith and hope are in God." After his last prayers in Gethsemane, Judas fulfils his betrayal of Jesus with a kiss to identify him and Jesus is arrested. Jesus is taken away to be rejected by those closest to him, to face trial, be whipped and crucified. John 17v1-5: Jesus said these things. Then, raising his eyes in prayer, he said: Father, it's time. Display the bright splendour of your Son So the Son in turn may show your bright splendour. You put him in charge of everything human so he might give real and eternal life to all in his charge. And this is the real and eternal life: That they know you, the one and only true God, And Jesus Christ, whom you sent. I glorified you on earth by completing down to the last detail what you assigned me to do. And now, Father, glorify me with your very own splendour, the very splendour I had in your presence before there was a world. On Monday night we learnt about Jesus' mission and identity. Then on Tuesday, we learnt about Jesus' final teaching - teaching his disciples about the Kingdom and his going back to the Fahter via the cross. Now, Jesus quite rightly now turns to prayer. Firstly praying for Himself, then for His twelve disciples and then finally for all disciples of all generations to follow, the church. This prayer is probably the pinnacle of revelation in John's gospel. Here we see Jesus' very words, revealing an unparalleled intimacy with His Father. 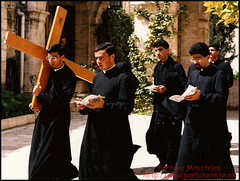 Jean Calvin said in his commentary on this chapter the following "After having preached to the disciples about bearing the cross, the Lord exhibited to them those consolations, by relying on which they would be enabled to persevere. Having promised the coming of the Spirit, he raised them to a better hope, and discoursed to them about the splendour and glory of his reign. Now he most properly betakes himself to prayer; for doctrine has no power, if efficacy be not imparted to it from above. He, therefore, holds out an example to teachers, not to employ themselves only in sowing the word, but, by mingling their prayers with it, to implore the assistance of God, that his blessing may render their labour fruitful. In short, this passage of the Lord Jesus Christ might be said to be the seal of the preceding doctrine, both that it might be ratified in itself, and that it might obtain full credit with the disciples." This scene, as portrayed by John, shows the importance of prayer and how when doing anything for the glory of God, it must be covered in prayer. Central to this part of His prayer is glorification. That is the glorification of Himself, in order that God the Father who sent Him will be glorified. Glorify is rarely used outside of church circles today. If ever it is, is usually in the context of somebody pretending to be better than they really are. Glorify means, in a biblical context, to have the person's true nature disclosed. So in effect, Jesus is saying in John 17v1: "May people see me for who I truly am, your Son. And may they also through Me, see Your true nature Father!" Praying as He does, just before He knowingly goes to His death on the cross, shows the importance of the cross. For it is through the cross, that both God the Father, and Jesus will be glorified. Jesus' death on the cross reveals a God of love, faithfulness and forgiveness. John 17v4 reveals that it was this purpose that He came, in order to complete the work given. Jesus' entire earthly life has been one to show divine love - to all people of every age and class. All His works and words were completed without even a hint of hypocrisy. His entire life was driven by the desire to see sinful people turn to God for reconciliation and forgiveness. At the cross and through the cross, this is achieved. Jesus confidently prays that having laid aside His glory by taking on human form, He will return to God's right hand, having achieved the work of redemption through the cross. The theme of eternal life runs throughout John's Gospel (John 3v15-16; John 10v28). Eternal life is knowing God personally and intimately, and that is only achieved by faith through Jesus' death on the cross. It is a free offer and open to all. It is the responsibility of all people to take up the offer. Once the offered is taken up, the responsibility is then to tell others of this offer. John 14v6-8: I spelled out your character in detail to the men and women you gave me. They were yours in the first place; then you gave them to me, and they have now done what you said. They know now, beyond the shadow of a doubt, that everything you gave me is firsthand from you, for the message you gave me, I gave them; and they took it, and were convinced that I came from you. They believed that you sent me. In this part of the prayer, Jesus prays for His disciples. Note how He describes them: they were chosen by God Himself, seen God in Jesus and have received God's words and obeyed them (John 17v6). John 17v6, 9-10 tells us that the disciples were in the safe possession of both the Father and the Son. John 17v7-8 shows what the disciples know. Despite misunderstanding frequently what Jesus was talking about, the disciples still grasped that Jesus had come from God. Having taught that they will endure persecution and suffering because they are His followers, Jesus prays for their safety. They will be safe, not because of their own cunning, character or conduct. They will be safe because of God's care and protection (John 17v11-12). As they are God's possession, He will ensure that they are watched over and protected. This security is also borne from glorifying God and being witnesses for Him (John 17v10). God is glorified whenever His salvation plan is explained and told. Who are the disciples' enemies and why do they need protecting (John 17v11-12, 15)? The first enemy is the world who does not know God and is therefore in rebellion against God. The disciples were told of this prior to this prayer. Satan is also an enemy of the disciple and will do all he can to stop God being glorified in the life of the disciple. How will God keep them safe? Their safety comes only through His mighty name and nature. By remaining loyal to Jesus, obedient to His teachings and telling others about Him, God's name & nature will therefore protect them. Jesus also prays that they may be filled with joy (John 17v13) and be dedicated wholly and solely to Him. The disciples now have a mission and purpose to fulfil - to tell others of Jesus. This mission though whilst their responsibility is not theirs alone, but is the continuation of Jesus' mission to bring people to reconciliation and relationship with God. Part of that mission is to live a holy life in the power of the Holy Spirit, for the Holy Spirit is the real and true pioneer evangelist! Living a holy life means living a life not for themselves but for the glory and obedience of Jesus Christ. John 17v24-26: Father, I want those you gave me To be with me, right where I am, So they can see my glory, the splendour you gave me, Having loved me Long before there ever was a world. Righteous Father, the world has never known you, but I have known you, and these disciples know that you sent me on this mission. I have made your very being known to them - Who you are and what you do - And continue to make it known, So that your love for me Might be in them Exactly as I am in them. Now Jesus prays for all those who, through the work of the disciples, will become His followers. As such, it brings all Christian disciples into intimacy with Jesus and a part of a dynamic relationship with Him. What does Jesus pray for His church of followers? Jesus prays for unity. That is unity on various levels. Firstly it is unity on the invisible, supernatural level (John 17v21-22). The lives of all Christian disciples are inextricably linked to each other, through the love and obedience of God the Son and God the Father. Christian disciples are united together because Jesus imparts upon them, the glory given to Him by God the Father (John 17v22). This unity is also physical, in so much as through a visible unity, people will come to know Jesus personally and take up the offer of reconciliation with God (John 17v21, 23). This unity is also physically seen, through the telling of the message of reconciliation (John 17v20). That is why different churches must be seen to work together - a visible sign of unity reflecting the invisible unity. Remember Jesus' words earlier in John's Gospel? John 15v12-14: "My command is this: Love each other as I have loved you. Greater love has no one than this that he lay down his life for his friends. You are my friends if you do what I command." Much later in his life, John must surely have reflected upon this when he writes in 1 John 3v16-24 "By this we know love, because he laid down his life for us. And we ought to lay down our lives for the brothers. But whoever has the world's goods, and sees his brother in need, and closes his heart of compassion against him, how does the love of God remain in him? My little children, let's not love in word only, neither with the tongue only, but in deed and truth. And by this we know that we are of the truth, and persuade our hearts before him, because if our heart condemns us, God is greater than our heart, and knows all things. Beloved, if our hearts don't condemn us, we have boldness toward God; and whatever we ask, we receive from him, because we keep his commandments and do the things that are pleasing in his sight. This is his commandment, that we should believe in the name of his Son, Jesus Christ, and love one another, even as he commanded. He who keeps his commandments remains in him, and he in him. By this we know that he remains in us, by the Spirit which he gave us." If the world sees Christian Disciples loving others sacrificially, then unity is seen and it is an effective witness to the reality of reconciliation with God, and a vibrant living relationship with Him. It is also imperative that prayer covers all the work of the church and the Christian - prayer is the foundation and the backbone, just as prayer was the strengthener for Jesus as He faced the cross. Without praying so earnestly that he sweated drops of blood, do you think He could have maintained the cross and its supreme significance for humanity? Heavenly Father, we thank you for Jesus Christ. We thank you that Jesus the Living Word is revealed in your Written Word, the Bible. Thank you that we have the very words of the Son of God for us to understand, enact and live. We thank you for His teaching ministry and as we come tonight to look at the final teaching before going to the Cross, we would listen with attentive ears and hearts to what you would teach us through the power of the Holy Spirit. We ask this through Jesus Christ our Lord and Saviour. Amen. We continue to look at different aspects of Jesus' final week. According to the plan I revealed last night, we were going to hear about Jesus' last prayers. However, that will now be tomorrow night. Instead, we are going to look at Jesus' last teaching before He goes to the cross to die. In these last few chapters before He is crucified, Jesus is saying goodbye to His disciples and giving them some final teaching before He departs. Several times He has told them He is going away (John 13v33; John 14v3-4, 19, 28). Today we are going to go quickly through John 15-16 and reflect upon this section of his final teaching sessions before He is arrested, betrayed, condemned and crucified. Of course, everything Jesus did in his earthly ministry was a lesson to be learnt and there are other events such as Peter's denials and subsequent repentance, where we can also learn lessons. But this chapter is Jesus' final active session of teaching His disciples. So what does he teach them? As usual Jesus uses Old Testament language, for in the Old Testament, the nation of Israel is often seen as a vine (Jeremiah 2v21; Psalm 80). However as a vine, Israel had not produced fruit that God had expected as explained in Isaiah 5v1-2 "I will sing for the one I love a song about his vineyard: My loved one had a vineyard on a fertile hillside. He dug it up and cleared it of stones and planted it with the choicest vines. He built a watchtower in it and cut out a winepress as well. Then he looked for a crop of good grapes, but it yielded only bad fruit." With Jesus describing Himself as the true Vine, the implication is clear that the nation of Israel was but an imperfect precursor to His perfect self. With Jesus as the vine, all believers are the branches, and all believers draw spiritual nourishment from Him. As part of this nourishment, sometimes pruning is required (John 15v2). Cleansing is also required in order that fruit be borne from the Christian Disciple. This cleansing is through regular confession of sin and partaking of Holy Communion as explained in the foot-washing scene of John 13. To prove to others they are His followers and His disciples, Jesus tells them they are to continue loving Him and also to sacrificially love others joyfully (John 15v12-14). By doing these things, which is now their mission statement, they will bear much good fruit for God's greater glory (John 15v8). The same is true of us today, if we are Christian Disciples. John 15v18: "If the world hates you, keep in mind that it hated me first." Having spoken of love and bearing fruit, Jesus now declares a warning and the context into which He is sending them. We learn from this passage that opposition to Jesus' message is unavoidable. The first opposition is that of the old nature attacking the new nature. Christian Disciples, Jesus said, were called out from the world (John 15v19). Christian Disciples upon conversion belong to a different place and are heading for a different place . Secondly, opposition is to be expected simply because of who Jesus is (John 15v21). Christian Disciples share in the life of Jesus and the way the world treats Jesus is the way the world treats all His disciples (John 15v20-21). Thirdly, opposition comes through revealing evil. Jesus, as the Light of the World, exposed evil and sin through His words (John 15v22) and works (John 15v24). At the beginning of His ministry, Jesus commanded all those who follow Him, to also be "lights of the world" (Matthew 5v14-16). This is done by consistently ensuring that our works and words match our lifestyle and that no hypocrisy will be found. Opposition brings persecution, and regularly throughout history, Christian believers have been persecuted for their faith in Jesus. In our own time, perhaps the most persecuted century of all. Being a Christian is not an easy decision, but it is worth it. It is also endurable because of three things: God still remains Lord God despite all; .we share in Jesus' own sufferings and therefore have fellowship with Him (Philippians 3v10) and by being persecuted, it shows we belong to Him (John 15v19). The main reason all opposition can be endured is because the Christian Disciple is not alone. God the Holy Spirit witnesses with the Christian Disciple (John 15v26). Not as a supplementary person filling a perfunctory role, but rather as the pioneer going out to testify about Jesus ahead (John 15v26) of the Christian Disciple (John 15v27). a. The first resource that Christian Disciples have is, as we have already seen, the Holy Spirit. After all, He is the real evangelist. In conjunction with Him, the Christian Disciple has three resources to use: proclaiming, counselling and discipling. Proclaiming (John 16v1-7): this is the proclaiming and elucidating work about Jesus that the Spirit performs. The Holy Spirit testifies about Jesus' death on the cross and subsequent resurrection (John 16v14). If Jesus did not go back to glory, and the Holy Spirit was not sent, then the pioneering work of the Holy Spirit would be missing from evangelism and mission. Not only does the Holy Spirit direct people to Jesus, but take them to Him. Counselling (John 16v8-11): As well as proclaiming about Jesus, the Holy Spirit speaks to people's hearts personally - one to one. This signifies the intimacy between the holy God and the believer. The Holy Spirit, convinces people hearing of God's Word of three things: their own sin (John 16v8); their separation from a holy & righteous God (John 16v10) and also in regards to the judgement of Satan and all who follow him (John 16v11). In these three things, a person is led to the Cross of Christ, in order to confess their sin and their need of Jesus Christ and the salvation only He can and is able to provide. Discipling (John 16v12-16): Once bought to faith, the Holy Spirit performs several tasks for the Twelve Disciples: He will guide them into all truth and develop what is coming in the future (John 16v13). The New Testament is the product of this work and that through the inspiration of the Holy Spirit. For the Christian Disciple today, the Holy Spirit helps them to apply the Bible to their life in order that Jesus Christ be glorified (John 16v14). b. The second resource available to the Christian Disciple is Jesus Himself! Jesus presence, provision and position. Presence (John 16v16-33):Yes, His very presence! The twelve disciples will experience sorrow and loss when Jesus is crucified and dead. But after the resurrection, their sorrow will turn to great joy - similar to the exceeding joy after the pains of childbirth! Christian Disciples today also have Jesus' presence with them, particularly when engaged in doing the work of an evangelist! Provision: Not only His presence, but also His provision! Through answered prayer, joy abounds (John 16v24)! Prayer is going to be of prime importance for the twelve disciples as it is a way to ensure unabated joy - joy even amidst suffering and trouble! Position: Finally, not only His presence, His provision but also look at His position! Jesus has overcome the world (John 16v33) and nothing can prevail against Him! If you are with Jesus, nothing will prevail against Him and He will protect you, provide for you and be with you in all you do, as you submit yourself to Him. Whether in the bad times or the good times, Jesus will be with you - but you need to ask Him to be with you and rely on Him fully. If you are going through bad times now, and don't know this Jesus yet, then ask Him to be with you - what have you got to lose? At the time of recording, this is Easter 2009 and it is Monday. We start a week of looking at Jesus Christ. Together, every night this week, we are going to look at different aspects of Jesus' final week. Luke 9:51 tells us that Jesus set his face towards Jerusalem. He knew that was where he was going to die. He knew that is where his mission would be accomplished and that his true identity would finally be revealed. But what was Jesus' mission and what was his identity, apart from being the son of a carpenter from Nazareth. So tonight, we start our Easter series by looking back and seeing together what his mission and identity are. Luke writes in Luke 4v42-44: "At daybreak Jesus went out to a solitary place. The people were looking for him and when they came to where he was, they tried to keep him from leaving them. But he said, "I must preach the good news of the kingdom of God to the other towns also, because that is why I was sent." And he kept on preaching in the synagogues of Judea." This is the beginning of Jesus' public ministry on earth! These verses at the end of Luke 4 tell us that His mission is to preach God's Kingdom. A reluctant John the Baptist baptized him and the crowds heard God the Father speaking to Him. He underwent temptations by the arch-seducer, satan and emerged victorious from that ordeal. Now Jesus, led by the Holy Spirit, has returned home to Galilee (Luke 4v14). Jesus is back in home territory and because of the power of His teaching, He is becoming known as a great teacher (Luke 4v15). Jesus spent some time in Galilee, become known and is arousing the interest, curiosity and excitement of people. Worshipping (Luke 4v14-18) - It was Jesus' habit to attend public worship wherever he was. He would have worshipped as any Jewish man would have. Because of His growing renown as a teacher, it is no surprise that he should be asked to read the Scripture and give a short teaching session regarding it. Here in Nazareth, Jesus declared that the day for demonstrating God's salvation had arrived and the day the prophets looked forward to, was going to be fulfilled in Jesus Himself (Luke 4v20). He was the Servant Isaiah had talked about long ago (Isaiah 61v1-2). His ministry was divinely directed; it was a ministry of hope for all people and a ministry to free the spiritually oppressed (Luke 4v18). When Jesus said in Luke 4v19 "to proclaim the year of the Lord's favour", Jesus was referring to the "Year of Jubilee" (Leviticus 25). Every fiftieth year, this special year was the balancing of the economic system. The local reaction was at first one of astonishment (Luke 4v22) and telling each other he was the son of Joseph! But Jesus was not the son of Joseph, but rather the Son of God, the new Adam and the founder of a new humanity as he goes on to explain. They saw Him as the son of Joseph. Admiration turned to anger, because Jesus began to remind them of God's goodness to the Gentiles. Whilst those in Nazareth could only see Jesus in the local setting, He told them His mission was for all Israel! And if Israel rejected this message of Good News, then the Gentiles would be blessed by it (Luke 4v25-27). Upon hearing this, the astonished admiration turned to furious anger (Luke 4v28-30)! Salvation is no longer restricted to Israel but for every child of Adam - every human. Jesus' mission was not to be Israel's saviour but the world's saviour. When Jesus quoted the proverb "no prophet is accepted in his hometown", he revealed his knowledge of Old Testament history. He knew that God's messengers often were rejected, and even as God's Son, he was rejected as well. Jesus' mission was to be the saviour of the world as God's Son (John 3v16) and the Servant of the Lord. His mission was to give a message of hope for the spiritually poor and spiritually oppressed people. Not only people in his hometown, nor only in Israel, but rather for the whole world. People have two choices when faced with this fact: accept or reject. There is no other option. And what of his identity? In Mark 8v27-33: Jesus asked His disciples, "Who do people say I am?" This section of the Bible contains the verse, when Peter calls Jesus the Christ or Messiah or Saviour (Mark 8v29), this divulges Jesus' true identity, In the preceding few verses Jesus and the disciples were in Bethsaida and there is the incident where Jesus healed the blind man. When the man is healed, Jesus instructs the man not to tell anybody! Why did Jesus stipulate taht? Because Jesus didn't want to be seen as only a healer and miracle worker. Now we come back to that climactic part of the Gospels when Jesus asked His disciples: "Who do people say that I am? John came ‘in the spirit and power of Elijah' (Luke 1v17), in a ministry of judgement, whereas Jesus came in a spirit of meekness and service. John performed no miracles (John 10v41), but Jesus was a miracle worker. Jeremiah called the people to true repentance from the heart, and so did Jesus. Both men were misunderstood and rejected by their own people. Both men condemned the false religious leaders and the hypocritical worship in the temple. Those in authority persecuted both men. Jesus' mission was to be the Servant of the Lord, and therefore, the saviour of the world as God's Son (John 3v16). His purpose as the Messiah was neither that He be served nor that He will lead a political overthrow of the Roman government as some had hoped. Rather, His purpose as the Messiah was to be God's servant and give a message of hope for the spiritually poor and spiritually oppressed people. When Jesus rebuked Peter, he was also telling off the other disciples (Mark 8v33). Remember that they did not yet understand the relationship between suffering and glory. By the time Peter had written his epistle 1 Peter, he did (1 Peter1v6-8, 1 Peter 4v13-5v10). Identify with Him in His suffering and death. Follow Him obediently, wherever He leads. What is the reward for the true disciple of Jesus? Satan promises glory now, but in the end suffering comes. God promises suffering now, but the suffering turns to glory. Spiritually, at this time, the disciples were still blind to who Jesus was, just as the man who was physically blind. Our confession of Jesus is a matter of life and death (John 8v21;1 John 4v1-3). Confession of Jesus as Lord is necessary for salvation (1 Corinthians 12v1-3), when that confession is from the heart (Romans 10v9-10). Christians are called to follow Jesus, to take up their cross and this could mean nothing less than being ready to suffer and die for Jesus. If we are ashamed of Him on earth, He will be ashamed of us when the end of the world has come. He will reward those deserving the reward, and deny those who deny Him. Finally, who do you say this Jesus is? What have you done with this Jesus - accepted or rejected Him?